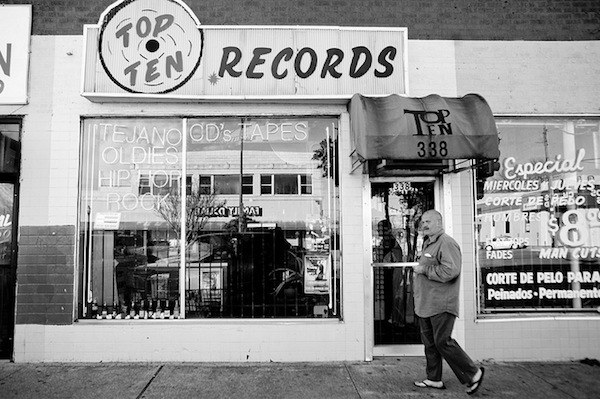 Oct. 11, 2013, 10:50 a.m.
How’s a listicle different from a definitive list or a framework list? Adding a little data science and taxonomy to the numerology of the web’s premiere list auteurs. By Caroline O’Donovan @ceodonovan Oct. 11, 2013, 10:50 a.m. I had called Shepherd to ask him about list length — why some lists have certain numbers of items, and how they get that way. 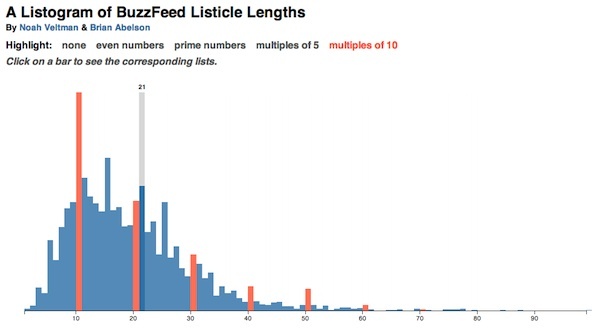 I was hoping there would be a science behind it, a big reveal that explained why some BuzzFeed lists get stretched out to 65 or 84, while others stop shy of 10. Veltman said in an email that his curiosity was piqued when he started to notice an increasing number of irregular list lengths, and fewer round numbers. 1. He owns a winery. 5. He’s practically a cowboy. 6. HE’S A HOT COWBOY WHO OWNS HIS OWN WINERY. Anyway — so what did Veltman learn crunching the data? Despite the perceived move away from round numbers, the four most repeated list lengths are 10, 15, 21, and 25. (One of these things is not like the others.) But overall, Veltman was surprised by how common it was to write lists over 30. “I’d have expected lists longer than 15 or 20 to be much rarer, since it seems like a lot to sit through AND it seems like a lot more work for the author,” Veltman wrote. In fact, Shepherd mentioned to a period in 2010 when there was an internal, unofficial competition in the BuzzFeed offices to see who could write the post that exceeded 100 by the most items. Brian Abelson, who collaborated with Veltman on the project and is also a Knight-Mozilla fellow, found a slight correlation between list length and how many tweets the list gets — the longer the list, the more tweets. “Certain editors get attached to certain numbers. I looked at my top ten viral posts of all time, and three of them have 21,” Shepherd says. @veltman @BuzzFeedBen @brianabelson does the author bias account for the popularity bias? Confounding variables!!! Indeed, there are some common rules that are applied to list length. But first, it’s important to understand that there are different kinds of lists, which I tried to categorize from my conversation with Shepherd. “There’s such a massive variety of experiences you can have with something that is a headline that happens to have a number in front of it,” he said. Second is the definitive list — the list that sets out to encompass all of something, like The 50 Cutest Things that Ever Happened. These lists have a strong tendency to go viral — 316,000 Facebook likes on that one so far — but they take a lot of effort. And finally, there is the framework list — the list that only exists to structure a narrative. Take, for example, 54 Reasons You Should Go To A Dog Surfing Competition Before You Die. This is the most important kind of list for BuzzFeed, the one that helped it get past its reputation for creating Internet drivel and begin building a broader audience. This kind of list has the best content, but also the most arbitrary length — there are as many items as it takes for the story to be done. That’s heady stuff. But the point is, list length has more to do with what’s in the list than with trying to guess which lengths readers are most likely to click. Shepherd is also interested in using mobile technology to gather data on at which points in a list readers start scrolling faster. which could correspond with the point at which they got bored. He also likes to look over the shoulders of list readers. “Something I would love to do — and it’s tough to get editors to do it when they’ve put a lot of time into a post — I would love to split test a bunch of different editorial posts. Let’s say an editor made a post that was 25 Steps to Get Through a Rough Day. I would like to have five versions of that post with different lengths and show readers different versions of that post and see which ones got the most sharing and see if we could get a sense,” he says. But ultimately — much as one might want analytics to deliver conclusive answers — the results are often fuzzy. “I tried to have a look at some of our writers who have the most viral posts, and there’s actually a pretty wide distribution of numbers,” says Shepherd. People make lists of all different lengths for all different reasons. And why people click on them likely has very little to do with having a natural affinity for the number 12 or refusing to read lists longer than 30. But thinking about list length does force us to consider the medium more seriously — something that BuzzFeed higher-ups have been trying to get us to do for a while. Ultimately, neither the magic of numbers nor science of numbers explains why people are drawn to lists to begin with — nor does length, on its surface, do much to telegraph what multitudes a list might contain. Photo by Thomas Hawk used via a Creative Commons license. POSTED Oct. 11, 2013, 10:50 a.m.
O'Donovan, Caroline. "The 3 Key Types of BuzzFeed Lists To Learn Before You Die." Nieman Journalism Lab. Nieman Foundation for Journalism at Harvard, 11 Oct. 2013. Web. 23 Apr. 2019. O'Donovan, Caroline. "The 3 Key Types of BuzzFeed Lists To Learn Before You Die." Nieman Journalism Lab. Last modified October 11, 2013. Accessed April 23, 2019. https://www.niemanlab.org/2013/10/the-3-key-types-of-buzzfeed-lists-to-learn-before-you-die/.